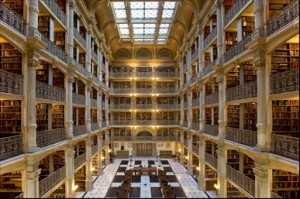 What’s happening: Staff and volunteers from the Johns Hopkins University’s Sheridan Libraries and University Museums will roll up their sleeves to clean the books, shelves, windows, and floors of the iconic stack room in the George Peabody Library. What will it look like? Still photos from last year’s cleaning are here. Volunteers will use cloths, feather dusters and vacuums to remove a year’s worth of accumulated dust from the scenic library and its valuable book collection. Background: The George Peabody Library opened in 1878 and features five tiers of ornamental cast-iron balconies. The library is routinely featured on lists of the world’s most beautiful libraries. With more than 300,000 volumes, mostly from the 19th century, it is a working research library and is administered by the Sheridan Libraries’ Department of Special Collections. To cover this event: Contact Brian Shields at 410-516-8337 (cell the day of the event: 443-631-2890) or bshields@jhu.edu.